Hillary Clinton bathroom break: "You know, it does take me a little longer." Hillary Clinton at the Democratic presidential debate in Las Vegas. Hillary Clinton has noted, at Tuesday night’s Democratic debate in Las Vegas, that electing a woman as president of the United States would be a historic first. She also, it seems fair to say, just became the first presidential candidate to make reference during a debate to how long it takes women to pee. 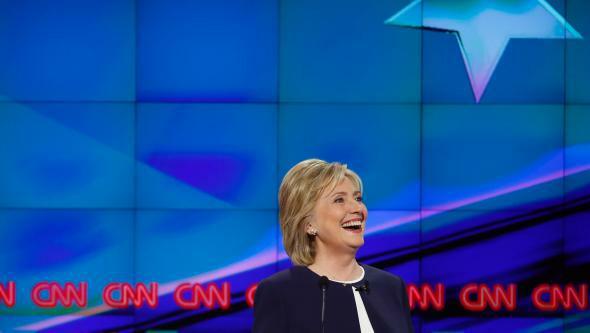 Anderson Cooper: And welcome back to this CNN democratic presidential debate. It has been quite a night so far. We are in the final block of this debate. All the candidates are back, which I’m very happy to see. It’s a long story. Let’s continue. Secretary Clinton, welcome back. Clinton: Well, thank you. You know, it does take me a little longer. That’s all I can say. Read more of Slate’s coverage of the Democratic primary debate.